Newnes Communications Technology Handbook provides a discussion on different topics relevant to communications technology. The book is comprised of 39 chapters that tackle a wide variety of concern in communications technology. The coverage of the text includes technologies, such as analog digital communications systems, radio frequency receiver, and satellite systems. 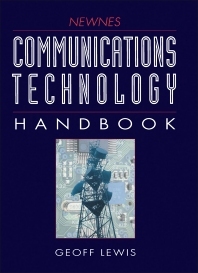 The book also discusses some methods and techniques used in communications technology, including mixer signal processing, modulation and demodulation, and spread spectrum techniques. The text will be of great use to engineers, technicians, and professionals involved in telecommunications. Geoff Lewis has spent many years in most branches of engineering including: motor vehicles, aeronautical, communication, telecommunication, production – as an engineer, teacher, lecturer, technical author. Geoff has a keen interest in environmental engineering including hydropower generated inventions. He has written on most of the above subjects, including 10 books, many journal articles and given public lectures. Geoff has long appreciated that knowledge is never wasted and that learning is a life long adventure. He has been told on many occasions that he has the ability to express complex concepts in a fairly easily understandable manner – at least this attribute is at the back of his mind when writing. Information Technology and Satellite Television consultant.